Ever wonder why more PGA Tour Champion players drank swingOIL at the Senior Open than played the #1 Ball in Golf? 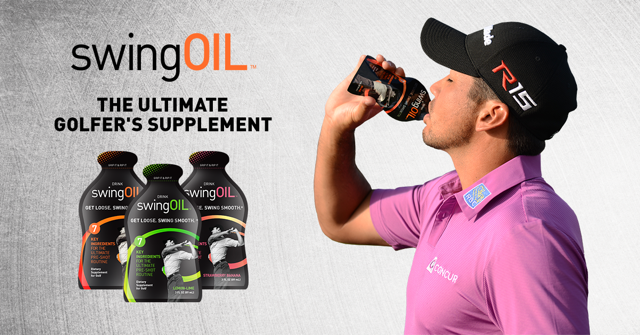 Why does the Jason Day, one of the top players in the world, make swingOIL a part of his daily routine? When we heard this amazing stat, our intrepid staff had to see what the buzz was about. What we found was a great-tasting drink that supplied us with energy for the back nine and allowed us to recover much sooner than on days we didn’t take swingOil. Our personal favorite is their orange flavor, but all three mixes were as solid as writing down a three on a long par-4. swingOIL, a 3 oz.drink, is the Ultimate Golfer‘s Supplement made by golfer‘s for golfers with several key ingredients to help support & promote flexibility & focus. NSF certified it is great before your round, at the turn or after your round. Stay lubed up with these two. It’s like an oil change for your body. Inflammation destroys smooth swings. Turmeric is here to help. Meet taurine: A low-cal, sugar-free pick-me-up for when you’re on the back 9. You love the game too much to take days to recover. Be glad this is in here. When you’re trying to putt or win the skin, focus matters. Enter ginseng. We all know what game-day stress is like. That’s why we included this. swingOIL, the ultimate golf supplement, is available in three delicious flavors: Lemon-Lime, Orange, and Strawberry-banana in a convenient 3 oz pouch. For every round on the course swingOIL is a golfer’s ideal companion. Drink it before tee-time, to stay loose; during your rounds, to avoid playing tight when it matters most; and after the final putt, to help your body prepare for tomorrow’s game.